The Treeline is an urban trail connecting the best of Ann Arbor.  It will be a defining feature of our geography, providing a common place to explore, bike, run, and reconnect with nature—and each other. Join us on the trail. It’s all of our responsibility to grow The Treeline. Find out how you can lend a hand by volunteering, spreading the word, and donating. New renderings of proposed Treeline: Allen Creek Trail are here! Visit our new website to learn more: https://t.co/eJv7KJNm96 (link opens in a new window).